We offer Web mail and forwarding features so that you can choose the e-mail service that best fits your needs. 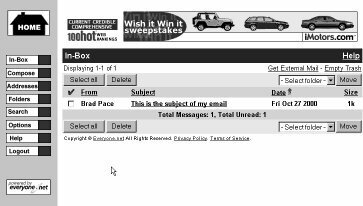 The Web mail option, which includes many advanced features, allows you to check your e-mail from any Web browser, at any time, and from anywhere. The forwarding option automatically transfers any e-mail sent to your domain to another e-mail account. Finally, an e-mail address you can be proud of! Our proprietary technology allows you to establish e-mail addresses that contain your own customized name in the address--making it professional enough for a business card and easy enough for friends, family members, and business associates to remember. Some of Our Web Mail Features . . .
Ability to get notification at another e-mail address when you receive mail.